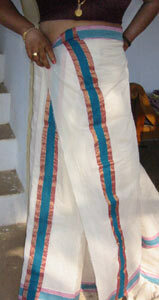 A two piece sari with a beautiful tribal elegance. 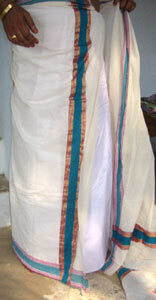 It is worn many ways in Kerala, from the formal style depicted in this section to the most delightful combinations of batiks on the bottom and an old stained hand loomed towel as the mundu, which means towel in Malayalam. The first step is putting the first wrap of fabric around your body, right to left, This first wrap is then tucked into the petticoat, making sure to keep the bottom edge even at the desired length, for the Mundu this is floor length. Line up the mundi stripe straight down the middle of your body tuck in and wrap around your body. Tuck the top border in to the petticoat at the right hip and tuck the entire waist in evenly around. Gather up the remaining cloth in your right hand and make two large pleats towards the outside. The stripe should be centered on the outside fold. Tuck it over your right hip, lining up the bottom edge of the pleats with the lower border. Tuck the pleats in the petticoat and straighten. 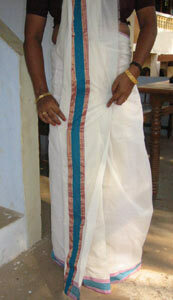 In the last photo above on the right you can see how to tuck the top cloth, or the mundu in at the waistline. Just tuck the top corner in and draw the cloth behind you and to the front at your right hip. Bindu shows how you can more formally pleat the pallu of the top cloth, lining up the pleats and folding them perfectly before placing them on your left shoulder and fanning them out over your chest. 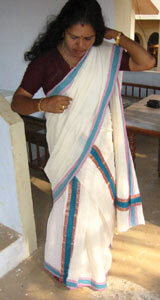 The mundu wraps around the body just like the pallu end of the sari in the nivi drape. 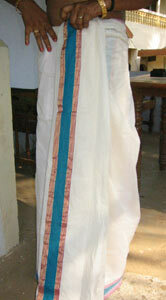 You can also form the pleats on the shoulder one at a time and then pin them to the pallu. 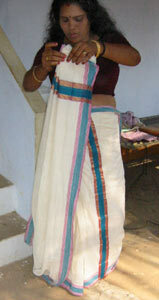 The mundu wraps around the body just like the pallu end of the sari in the nivi drape. 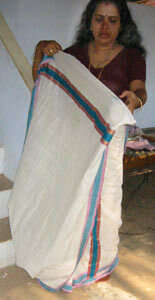 You can also form the pleats on the shoulder one at a time and then pin them to the pallu. The last picture shows the option of tucking the mundu in under the pleats where it can be pinned to the petticoat for maximum security! 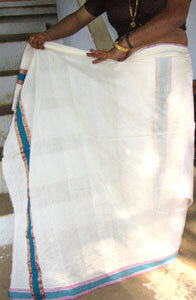 On the beaches of Kerala, working women wear a different outfit of a printed lunghee on the bottom, with a simple hand loomed towel over their shoulders. 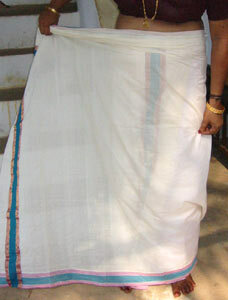 Wearing the choli alone is not proper but with a small strip of towel obscuring the breast area the fruit and fish sellers of kerala have a comfortable and practical costume for their working day.